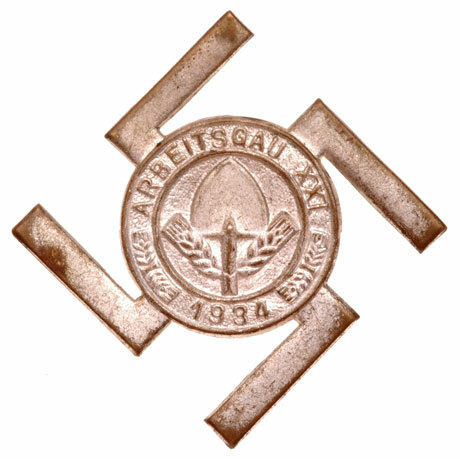 The German Reichsarbeitdienst (RAD), or German National Work Service, was formed in July of 1934 as the offical state and party labor service. It was divided into seperate sections for males and for females. 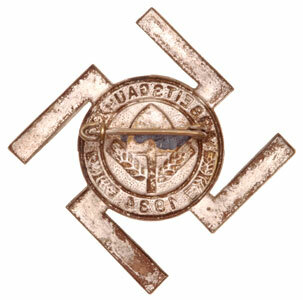 The Reichsarbeitdienst Manner, or RAD/M, was set up for men, and the Reichsarbeitdienst der weibliche Jugend, or RAD/wJ, for females. The RAD/M was organizied into Arbeitsgau, or Divisional Districts, each being numbered with a Roman numeral between I and XXXX (1 and 40). Early District XXI Badge: tombac w/silver brennlack finish, 52 mm, soldered pin, scarce, light to moderate wear.